Chu shogi wood set. Promotion sides show red. Chu shogi (中将棋 chū shōgi, "mid [sized] shogi") is a strategy board game native to Japan. It is similar to modern shogi (sometimes called Japanese chess) in its rules and gameplay. Its name means "mid-sized shogi", from a time when there were three sizes of shogi variants in regular use. Chu shogi seems to have been developed in the early 14th century as a derivative of dai shogi ("large shogi"). There are earlier references, but it is not clear that they refer to the game as we now know it. With fewer pieces than dai shogi, the game was considered more exciting. It was still commonly played in Japan in the early 20th century, especially in Kyoto, but now has largely died out. It has, however, gained some adherents in the West. The main reference work in English is the Middle Shogi Manual by George Hodges. The objective of the game is to capture the opponent's king and, if present, the crown prince, which counts as a second king. Alternatively, if the player has only the king or crown prince, together with an unpromoted gold general, it suffices to capture all the other pieces, leaving a bare king or a bare crown prince, whereupon the player wins and the game ends early. Unlike standard shogi, pieces may not be dropped back into play after capture. Two players alternate making a move, with Black moving first. (The pieces are not differentiated by color; the traditional chess terms "Black" and "White" are only used to indicate who plays first, and to differentiate the sides during discussions of the game.) A move consists of moving a piece either to an empty square on the board or to a square occupied by an opposing piece, thus capturing that piece; and optionally of promoting the moving piece, if all or part of its move lies in the promotion zone. 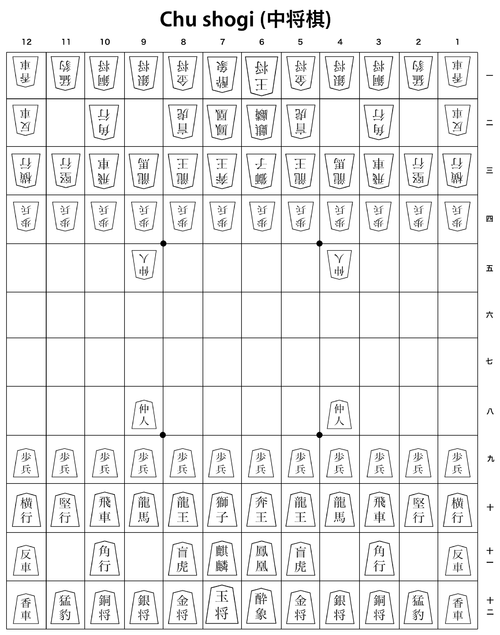 Two players, Black and White (or 先手 sente and 後手 gote), play on a board ruled into a grid of 12 ranks (rows) and 12 files (columns). The squares are undifferentiated by marking or color, unlike a Western chess board. Initial setup with the full name in kanji on each piece. Listed below are the pieces of the game and, if they promote, the pieces they promote to. Names are rough translations that have become somewhat standardized in English. Pieces are listed alphabetically by their English name. The promotions apply only to pieces which start out with the ranks in the left-most column, that is, pieces with these ranks written in black; promoted pieces with those same ranks written in red may not promote further. Pieces which only appear upon promotion, that is, names which only occur written in red, are marked with an asterisk. The king, free king, and lion do not promote. 1 The names of 龍馬, 奔王, 反車, and 白駒 are irregular. The regular forms ryūme, hon’ō, hansha, and hakuku are also seen. 2 In many accounts of chu shogi, a pawn is described as promoting to gold; the special name tokin for a promoted pawn is in these descriptions restricted to standard shogi. Note that this is simply a naming convention and makes no difference in the movement of the piece. Below is a diagram showing the setup of the players’ pieces. The board setup is symmetrical: the way one player sees their own pieces is the same way that the opposing player sees their pieces. The promotion zone is the 'enemy camp', the farthest four ranks of the board, which are mostly occupied by the opposing player's pieces when the board is first set up. When a promotable piece makes a move within the promotion zone - including entering, leaving, or moving entirely within the zone, - it has the option of "promoting" to a more powerful rank. Promotion is effected by turning the piece over after it moves, revealing the name of its promoted rank. Promotion is not mandatory if the unpromoted piece could move further on a later turn, and in some cases it may be beneficial to leave the piece unpromoted. Promotion is permanent and promoted pieces may not revert to their original rank. If a piece is not promoted upon entering the promotion zone, then it may not promote until it leaves the zone and reenters unless it makes a capture, with the exception of pawns: if a pawn does not promote once entering the promotion zone, then it may not promote until it reaches the farthest rank. Promoting a piece has the effect of changing how that piece moves. See below. If a pawn reaches the furthest rank, it must always promote, since it would otherwise have no legal move on subsequent turns. No such exception exists or is needed for lances, as there is never any reason to defer promotion of a lance in the first place: therefore, a lance that reaches the furthest rank without promoting becomes immobile. An opposing piece is captured by displacement: That is, if a piece moves to a square occupied by an opposing piece, the opposing piece is displaced and removed from the board. A piece cannot move to a square occupied by a friendly piece, that is, by another piece controlled by the moving player. Each piece on the game moves in a characteristic pattern. Pieces move either orthogonally (that is, forward, backward, left, or right, in the direction of one of the arms of a plus sign, +), or diagonally (in the direction of one of the arms of a multiplication sign, x). The lion is the sole exception, in that it is not required to move in a straight line. As stated earlier, this game is based on dai shogi and all of the pieces of this game can be found in dai shogi. The eight types of pieces that were removed all promoted to gold generals, which made for comparatively dull gameplay. If a pawn or lance, which cannot retreat or move aside, advances across the board until it reaches the other side, it must promote. Some pieces move only one square at a time. If a friendly piece occupies an adjacent square, the moving piece may not move in that direction; if an opposing piece is there, it may be displaced and captured. The step movers are the king, drunk elephant, blind tigers, ferocious leopards, the generals, go-betweens, and the 12 pawns of each side. Only the king and crown prince can potentially move in all eight directions. Several pieces can jump, that is, they can pass over any intervening piece, whether friend or foe, with no effect on either. These are the lion, the kirin, the phoenix, the horned falcon and the soaring eagle. Only the lion can jump in all directions. Many pieces can move any number of empty squares along a straight orthogonal or diagonal line, limited only by the edge of the board. If an opposing piece intervenes, it may be captured by moving to that square and removing it from the board. A ranging piece must stop where it captures, and cannot bypass a piece that is in its way. If a friendly piece intervenes, the moving piece is limited to a distance that stops short of the intervening piece; if the friendly piece is adjacent, it cannot move in that direction at all. The ranging pieces are the free king, dragon king, dragon horse, rook, bishop, vertical mover, side mover, reverse chariot, lance, and all those pieces which do not appear in the initial setup. Only the free king can range along all eight directions. The lion has a double-capture ability, called a 'lion move', as to a lesser extent do the soaring eagle and horned falcon (promoted dragon king and dragon horse). The details of these powerful moves are described for the lion below. Following are diagrams that indicate the movement of each piece. Pieces are listed roughly in order, from front to back rows, with pieces making similar moves paired. Pieces with a grey heading start out in the game; those with a blue heading only appear on the board as a promoted piece. Betza's funny notation has been included in brackets for easier reference, with the extension that the notation xxxayyyK stands for an xxxK move followed by an yyyK move, not necessarily in the same direction. By default continuation legs can go into all directions, but can be restricted to a line by a modifier 'fb' = 'v'. The default modality of the final leg is the usual 'mc', but on non-final legs also includes a hop over an obstacle at their end-point, provided the path does not bend back onto itself there. It must promote upon reaching the farthest rank of the board. Because it cannot move orthogonally, an unpromoted bishop can only reach half the squares on the board. Because of its unusual movement, an unpromoted kirin can only reach half the squares on the board. If a crown prince is in play, it must be captured along with the king. The next three pieces have special movements that involve the ability to move and even capture twice per turn. The horned falcon can move any number of free squares along a straight line in any direction except directly forwards. The soaring eagle can move any number of free squares along a straight line in any direction except the forward diagonals. The lion can take a step in any direction up to twice per turn. It can continue after a capture on the first step, potentially capturing two pieces per turn. It can change directions after the first step, so that it can reach the squares that a knight jumps to in Western chess. By returning to its starting square with the second step, it can effectively capture a piece on an adjacent square without moving. This is called 居喰い igui "stationary feeding". It can step to an adjacent empty square and back without capturing anything; this leaves the board unchanged, effectively passing a turn (jitto). Jitto may prove useful in endgame situations; it is traditionally indicated by tapping the lion and leaving it in place. A lion can always capture an adjacent lion (on a "!" square). It can always capture a non-adjacent lion (on a "☆" square) if, supposing it had done so without capturing anything else, remains safe for at least one turn. Finally, if one player captures a lion with a non-lion, the opponent cannot then capture a lion on the next move with anything but another lion (as a player may have such a second lion by promoting a kirin), and this may only be done if the rules listed above are met. In recent times the Japanese Chu Shogi Association has amended this with the so-called Okazaki rule: the counter strike against the lion would only be forbidden if that lion was protected. These rules also apply to promoted kirins. The cases where a hidden protector is blocked by a pawn or go-between that is captured with the lion, or where a false hidden protector of a pawn or go-between is captured together with the lion are unclear, as modern and historic rule descriptions do not mention them explicitly. The interpretation would depend on whether one treats the explicit mention of the hidden protector case as an illustrative example to show that the situation should be judged as it is before the proposed capture instead of after it, or as a special case in an exhaustive summary of allowed lion-lion captures. A player may not make a move if the resulting position is one that has previously occurred in the game with the same player to move. Note that certain pieces have the ability to pass in certain situations (a Lion, when at least one square immediately adjacent to it is unoccupied, a Horned Falcon, when the square immediately in front of it is unoccupied, and a Soaring Eagle, when one or both of the two squares immediately diagonally in front of it are unoccupied). Such a pass move leaves the position unchanged, but it does not violate the repetition rule, as it will now be the turn of the other player to move. Of course, two consecutive passes are not possible, as the first player will see the same position as before. The Japanese Chu Shogi Association plays by more complex repetition rules. Only a fourth repetition is forbidden, and the burden to deviate is not necessarily on the player that reaches this first. If one side is making attacks with his moves in the repeat cycle, and the other is not, the attacking side must deviate, while in case of checking the checker must deviate regardless of whether the checked side attacks other pieces. In the case of consecutive passes, the side passing first must deviate, making turn passing to avoid zugzwang pointless if the opponent is in a position where he can pass his turn too. When a player makes a move such that the opponent's only remaining royal (king or crown prince) could be captured on the following move, the move is said to give check; the king or crown prince is said to be in check. If a player's king or crown prince is in check and no legal move by that player will get it out of check, the checking move is also mate, and effectively wins the game. Unlike Western chess, a player need not move out of check in chu shogi, and indeed may even move into check. Although obviously not often a good idea, a player with more than one royal may occasionally sacrifice one of these pieces as part of a gambit. A player is not allowed to give perpetual check. This is not a rule in itself, but arises from the repetition rule. A player who captures the opponent's sole remaining king or crown prince wins the game. As an alternative, there is the "bare king" rule. A historic description of Chu Shogi mentions, "When pieces are gone, and there are only the 2 kings, one can mate only if he has a promoted gold". The Japanese Chu-Shogi Association has altered this into a general baring rule similar to that of Shatranj, where a bare King immediately loses against any other material, unless you can bare the opponent on the following move (in which case the game is a draw). In practice these winning conditions are rarely fulfilled, as a player will resign when checkmated, as otherwise when loss is inevitable. Games between players of disparate strengths are often played with handicaps. In a handicap game, one or more of White's pieces are removed from the setup - in exchange, White may move up a few of his pieces or rearrange them to fill in the gaps and protect the weaker pieces, and White plays first. Lions can also be handicapped by having Black's kirin promoted for a second lion, and, for a third, swapping Black's phoenix for White's kirin and promoting the latter. The imbalance created by this method of handicapping is not as strong as it is in international chess because material advantage is not as powerful in chu shogi as it is in chess. Other handicaps may be used, such as Free King, or Free King and Dragon King. The method used in English-language texts to express shogi moves was established by George Hodges in 1976. It is derived from the algebraic notation used for chess, but modifications have been made for chu shogi. If a move entitles the player to promote the piece, then a + is added to the end to signify that the promotion was taken, or an = to indicate that it was declined. For example, px7d= indicates a pawn capturing on 7d without promoting. In cases where the above notation would be ambiguous, the designation of the start square is added after the designation for the piece in order to make clear which piece is meant. When a 'Lion', 'Horned Falcon' or 'Soaring Eagle' captures by 'igui' (that is, without moving), the square of the piece being captured is used instead of the destination square, and this is preceded by the symbol '!'. For example, a Lion on 8c capturing a piece on 9d would be shown as Lnx!9d. When a piece makes a double capture with 'Lion' powers both captures are shown in the order that they were made. For example, a Lion on 3g, capturing a piece on 3h and then capturing another on 2i, would be represented by Lnx3hx2i. Moves are commonly numbered as in chess. 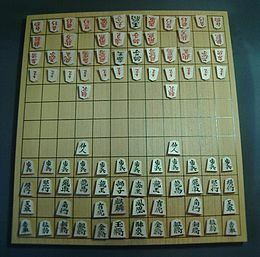 One modern variant of chu shogi, called Heisei chu shogi (平成中将棋), is played on a more open board. Forty percent of the pieces are set aside at setup and held in reserve, and once during the game a player may drop one of these on an empty square adjacent to a friendly piece. Captured pieces do not come back into play, and the rest of the game is played as in regular Chu. The set-aside pieces are the Lances, Coppers, Silvers, Side Movers, Vertical Movers, Reverse Chariots, Kyrin, and Phoenix. As with dropped pieces in standard shogi, the piece may not be dropped on a square from where it cannot move (e.g. a Lance in the far rank). If dropped into the promotion zone, the piece may promote immediately or on any subsequent move in the promotion zone. These average values do not take into account the special status of the king and crown prince as royal pieces. They have also been normalized so that the pawn is worth 1 point to avoid fractions. Additionally, pieces gain in value if they have a good chance of promotion. This is particularly significant for the phoenix and kirin, which promote to the two most powerful pieces in the game.